The Dutch national museum Rijksmuseum in Amsterdam has digitized 125,000 works from its collection. They're available as high-resolution downloads free for personal use. Another 40,000 images will be added every year until the entire collection of one million pieces is available. 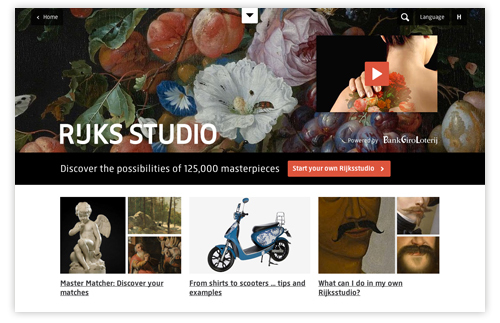 You can create a free Rijks Studio account and categorize all your favorite images in folders, sort of like Pinterest. (Browse other users' collections here.) You could download your favorites and decoupage them onto your calculator or print them on tattoo paper and stick them all over yourself. Another option: recolor them and make stationery like these examples by Flow Studio. Have fun! Thanks for the link - I love your links! I have signed up for the account but am unsure how to view the images that are free - can you give me a quick walkthrough? Thanks! OOO. Thanks for the resource! This looks great! or browse other people's saved images (a link is in my post), or search for a subject (click the magnifying glass at the top menu). After you click a small image you like and it fills your screen, click the scissors at the bottom and choose "download this work," then choose "personal use." Agree to the terms and hit "download." There was an interesting, yet heartbreaking, story in Newsweek Online regarding the Dutch museums. I had read it just the night before this post came online. The Dutch museums have identified and are returning over 100 works of art IN ONE SEARCH that they have now identified as being taken from Jewish homes by the Nazis and others during the Holocaust. It has taken all this time to fess up and declare they have been boldly showing items that were in question. Though the original owners have long since perished, their descendants will have the opportunity to hold onto something that was long since though lost forever. The Dutch are using all means possible, including online galleries, to locate the proper owners and footing the bill for it. How sad. No other country, not even the United States, has made such a declaration or gone to such great lengths to remedy what was a horrific chapter in history. I do not want to be a downer, but I will not be visiting sites such as these, no matter what the temptation may be. Those that have had even the smallest question in their mind as to where their art treasure came from should have come forward long ago, especially when they are in the business of art treasures. The Hollocaust was real. Blood art is real. Over 100 works of art found in one search, that is the largest of its kind ever. They were not hidden under a bed, but right out in the open, on display, without shame. It breaks my heart that it took so long. I am just glad it finally is happening. If only technology could restore life as it restores ownership. Awesome. These would make great fabrics.